It’s a major check on the life list of many New England hikers: summiting all 48 of New Hampshire’s 4,000-footers. Whether you’re on the trail to this hiking milestone, or have already accomplished it, check out these resources and gear that celebrate this iconic list. First of all, here’s the official list of the 48 peaks from the volunteer-run Four Thousand Footer Club. Hikers who successfully climb them all can submit a membership application, which earns them both recognition and a nifty shoulder patch (pictured). Anybody heading for the high peaks should of course have a copy of AMC’s White Mountain Guide. It comes with a full set of paper maps for the Whites, or you can buy a separate map set printed on durable, waterproof Tyvek. 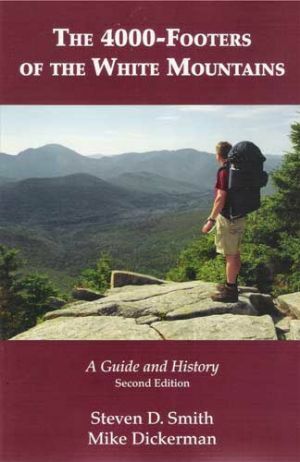 For more detailed route and historical info, check out The 4,000-Footers of the White Mountains by Steven D. Smith and Mike Dickerman, a 550-page volume of everything you ever wanted to know about these high peaks. Also consider carrying Scudder’s White Mountain Viewing Guide, which diagrams every summit visible from 47 peaks in the Whites. A range of other products are available to help you keep track of the 4,000-footer list. 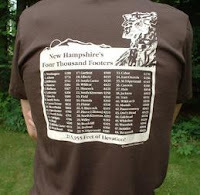 You can order a 4,000 Footer Club T-shirt or visit Ragged Mountain Equipment of Intervale, N.H., which has an entire product category for NH 4,000 Footers, including a water bottle, beer glass, and men’s and women’s T-shirts.